- Our handcrafted bathing bar is freshly prepared using organic vegetable oils giving it a rich soft lather. 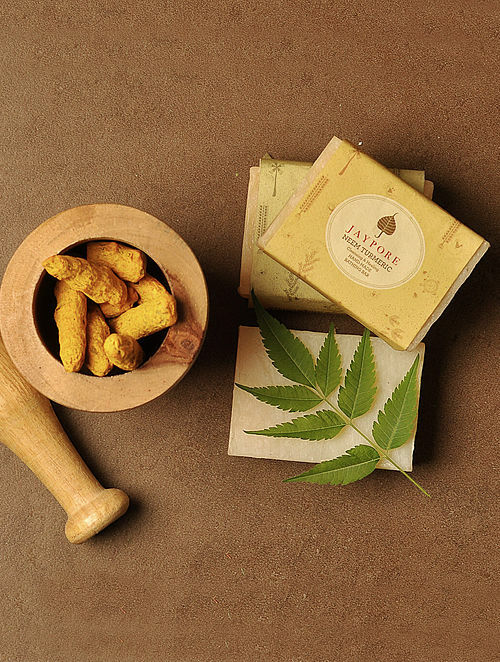 Infused with anti-bacterial neem oil and turmeric extract, it protects the skin from infections, drying itchiness, leaving the skin smooth and supple. - Ingredients:- Organic Coconut Oil, Purified Water, Olive Oil, Sweet Almond Oil, Organic Shea Butter, Turmeric Oil, Organic Neem Oil.